Genuine OEM Xerox Maintenance Kit, 150,000 page yield. Xerox part number: 115R00069. Maintenance Kit compatible with Xerox Phaser 4600, 4620. Genuine OEM Xerox Toner Cartridge, Black, 13,000 page yield. Xerox part number: 106R01533. Laser Toner Cartridge compatible with Xerox Phaser 4600, 4620, 4622. Qualifies for free shipping & earn 252 points! Genuine OEM Xerox Toner Cartridge, Black, High Capacity 30,000 page yield. 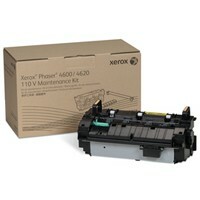 Xerox part number: 106R01535. Laser Toner Cartridge compatible with Xerox Phaser 4600, 4620, 4622. Genuine OEM Xerox Drum Unit, 80,000 page yield. Xerox part number: 113R00762. Drum Unit compatible with Xerox Phaser 4600, 4620.